I surely said this before but if you are so fortunate to do fluid dynamics simulations as your profession you can always learn something new. 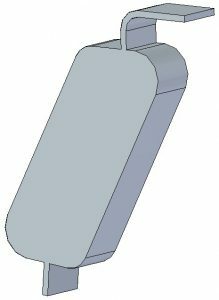 Controlled cooling of cylinder head castings after solidification? Sounds cool! 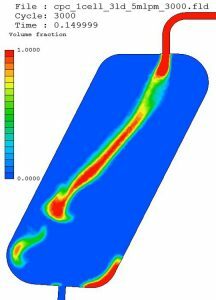 Simulation of wall erosion in a glass melting furnace? Exciting! 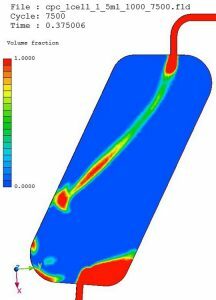 Simulation of 2-phase flow within a Centrifugal Partition Chromatography (CPC) machine and design of a new cell shape? The mother of all simulations, though I never saw such a machine before and I just guessed how complex this simulation could be when I met the young and talented chief innovation officer of RotaChrom Ltd. But the CTO wisely put a metallic disk on the table when we first met, a disc full of precisely cut holes in it. If you are a petrolhead like myself you would say this was a disc brake with internal cooling channels but the holes were elliptical (like on the picture on the right) or rectangular with rounds in the corner, not cylindrical. 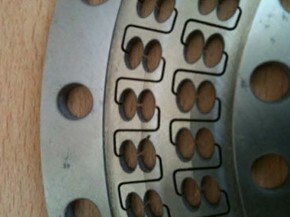 The usual round holes around the special ones are for bolts to press and hold together an assembly made of many discs which assembly forms a long single channel of cells. My introduction to chromatography happened while sipping a lovely pint of Guinness. The aim of the kind of chromatography (CPC) we were dealing with was to extract and thus purify molecules solved in fluids. These purified molecules are called fractions. To do this we need two immiscible fluids (phases), one of them contains all the molecules (solutes) we want to extract, let’s call this phase the moving one. Let’s call the other phase the stationery one. Names of phases hold some additional info on how the procedure works because at the beginning of purification, cells of machine (like the ones on the above figure) are filled with stationary phase and discs containing the stationary phase are rotated around their axis. After that moving phase is pressed through the system of cells. Stationary and moving phases do not fancy each other, they do not solve in each other (immiscible) one of them is hydrophilic, the other is hydrophobic and their density is different too. The moving phase – because of cell shape and centrifugal force – breaks apart into very small droplets which make contact with the stationary phase within cells. The molecules we are searching for have a distinctive feature which is their solubility in stationary phase. Stationary phase works like a special filter which slows down our molecules according to their solubility. If a molecule is highly soluble in stationary phase then it takes more time for this molecule to travel through the chain of cells compared to a molecule poorly soluble in stationary phase but highly soluble in moving phase. The molecule that has the worst solubility in stationary phase runs through the system in the shortest time and can be caught at the beginning of the purification process. Molecule content of moving phase is measured and the machine detects when a molecule starts appearing and running out. These molecule fractions are collected separately as long as the slowest molecule leaves the chain of cells. What happened in a cell in terms of flow phenomena was not deeply investigated in the past, however we managed to find a pretty good reference . Adelmann et al. 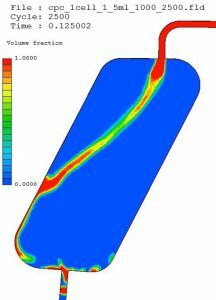 used OpenFOAM to model flow features within the cell but the real value was that it contained a comparison of simulated and measured results. Measurements (I am calling these PIV rotor tests from now on) were made on a test disc using a high-speed camera so that flow patterns could be recorded and analysed. 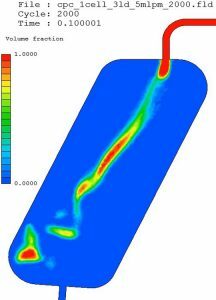 Our first simulation job was to see what SC/Tetra could do with the Adelmann geometry (figure on the right) and phase material properties and moving phase volume flow rates. While reading the article we realized that the authors used a quite special boundary condition setting. To understand it we need to be aware the three forces acting on the cell and on fluids inside: centrifugal force coming from rotation, gravitational force and Coriolis-force. The authors took all three into account but these forces were set as external ones applied to each grid element. This leads to the fact that in their simulation CPC cells did not make a rotating motion. Setting of forces like this has several advantages but I believe there is one disadvantage as well. mesh can have a smaller resolution (element size can be bigger). I believe this solution is literally forced, meaning that this setting determines flow features before a single simulation has been started. We thought this disadvantage would have its fingerprint on solutions if we wanted to develop new cell shapes. So even the first validating runs were made using real rotating motion and only gravity was set as an external force. The other two forces were generated automatically by the rotating motion. 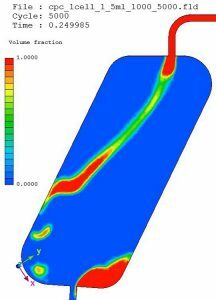 I mentioned above how important roles the two phases had so it was not even a question that we would set up a transient two-phase flow simulation using VOF (Volume of Fluid) method. Adelmann et. al. examined several solvent systems, we used ethyl acetate (stationary phase) and water (moving phase) pair since material properties, behaviour of phases were all well known. During validation project many of the moving phase flow rates and rotational speed combinations stated in  were analysed, mostly those were chosen for which both simulated and measured data and photos were available. Let’s take a look at the results for 5ml/min moving phase flow rate and 1000 1/min rotating speed. Coloured pictures show results of SC/Tetra simulations, black-and-white ones show results of PIV tests of . What experts in CPC use to decide whether a solvent system and a cell is efficient enough, is the shape moving phase (shown red on the picture on the right) has when entering at the top and while flowing in the cell. If they are lucky enough to take a look at it somehow, otherwise it would be just the same old trial and error kind of development. Anyway, a cell does its job well if the entering phase jet breaks into small droplets fast, the sheet of moving phase is not bent towards cell wall and only a small amount of it remains at the bottom of the cell. 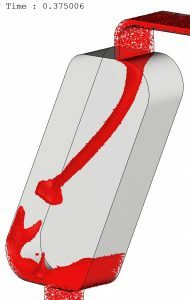 We aim to maximise contact surface between stationary and moving phases, this aim is adversely affected if sheet of moving phase is bent too early by Coriolis force towards cell wall. The picture on the right shows a result which is acceptable in terms of moving phase sheet shape for this given cell: red moving phase is not bent that much and there is not much moving phase collected at the bottom of the cell near the outlet. Compared to PIV rotor test results it was clear that in SC/Tetra simulations moving phase sheet was less bent and volume of residual moving phase at cell outlet was almost the same both in terms of quantity and in shape. When increasing cell RPM while keeping moving phase flow rate unchanged we saw an even less bent moving phase shape and volume of residual at the bottom decreased. So far so good. Let’s put the case on the table in which flow rate of moving phase was 20ml/min together with 1000 1/min rpm. In the Adelmann article there was a figure which compared PIV test results and OpenFOAM simulations for 21ml/min and 1000 1/min rpm. This can be seen on the left side of the figure below. On the right we have SC/Tetra results in case of 20 ml/min flow rate 150, 350 and 750 ms after starting simulation. When comparing OpenFOAM and PIV rotor test results one can notice the difference in quantity of residual moving phase near cell outlet, namely there is more moving phase at the bottom in PIV test. On the other hand the location where moving phase sheet touches cell wall is almost identical. When comparing PIV rotor tests and SC/Tetra simulations you can clearly see that residual quantity, shape and location are very similar but there is a difference in the location of wall contact. 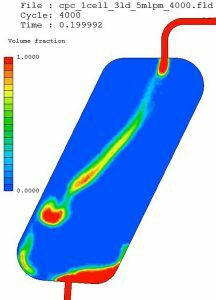 SC/Tetra simulation results also demonstrate changing shape of moving phase sheet as simulation went on, meaning that bending of sheet increased during our 750ms simulation time while quantity of residual at the bottom remained almost the same. What can be derived from all this when we want a workflow that leads us to a new and more efficient cell shape? 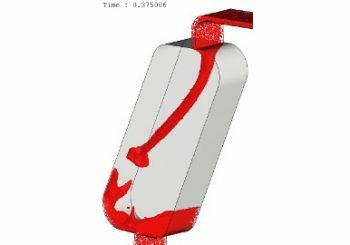 When using real rotating motion it takes much longer to get to a steady and developed flow field than for a simulation using forces set on mesh elements. Because of that a real motion simulation requires much more iterations to run. But the first good news is that it is capable of more accurately estimating residual moving phase volume at cell bottom. 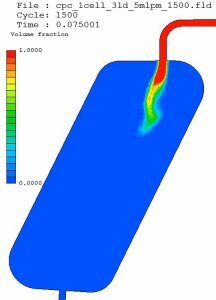 The other good news is that SC/Tetra simulations performed well in calculating bending of moving phase sheet, because bending always happened when PIV rotor tests showed it and extent of bending changed the proper way when flow rate or rpm parameters changed. So for us it was worth using real rotating motion despite the longer simulation time compared to direct force setting. In return we had a workflow that gave us more accurate results that could forecast the effects of the tiniest change in cell shape. Later in the project it was proven that our way of doing this brought satisfactory results, since under a couple of months we could develop a new cell shape, build a test machine and measure purification efficiency. It turned out that this cell could purify molecules twice as fast as a competitive one. Obviously it was patented. Development of new cell shapes and CPC machines never end at RotaChrom and I am just as excited to learn and develop something new as 3 years ago when our cooperation started. S.Adelmann, C. Schweinheer, G. Schembecker: Multiphase flow modeling in centrifugal partition chromatography; Journal of Chormatography A, 1218 (2011) 6092-6101.